For those chocoholics it's difficult to believe that your favorite desserts could get any better. However, stout has a distinctive flavor derived from the massive amounts of dark malts and a creamy body that give cakes and other chocolate desserts an intense, dark chocolate flavor that is not-too-sweet. Below are two of my favorite recipes. I hope you enjoy! Take 8 oz of semisweet chocolate and chop into small pieces (which will help the chocolate melt faster). Place in a stainless steel bowl that will fit on top of a small pan filled with a few inches of water (double boiler). Place the pan over medium heat (a rapid boil will make the chocolate burn too fast). Be careful as to not get any water into the chocolate. Add the cream and beer of choice. With a spatula, stir occasionally until the chocolate has melted and the cream/beer has been incorporated into the chocolate. Remove from heat and let sit on the counter for 20-30 minutes, or until the mixture is the consistency of peanut butter. You can speed this process up by placing the bowl into the refrigerator, stirring every few minutes. Cover a cookie sheet with wax paper. Using a melon baller or a teaspoon, make small uniform balls and place onto the wax paper. Trying not to over handle the chocolate mixture too much, causing them to melt - use your palms to roll each into a round ball and place back onto the wax paper. Once all the chocolate has been rolled, place the plate back into the refrigerator for 30 minutes, or until firm. 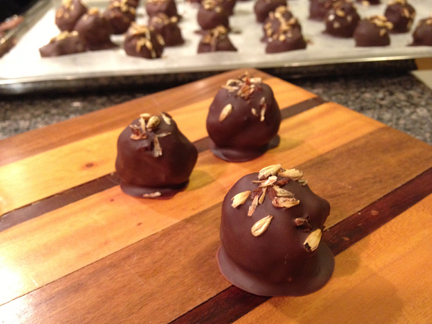 Take the 8 oz of dark chocolate, chop into small pieces, add to another stainless steel bowl. Place over a small pan on medium heat as before and stir with a spatula until chocolate has melted. Take a cake cooling rack, and place a piece of wax paper underneath. Remove your truffles the refrigerator, one at a time, drop into the melted chocolate, turning with a skewer or small untensil, until the truffle is fully coated. Remove from the melted chocolate, place on the rack, and place a pinch of salt (or garnish) on top of each before it cools. Once the chocolate has hardened, place into a covered container and refrigerate until ready to serve. *Beer suggestions: Any traditional dry or oatmeal stouts work. 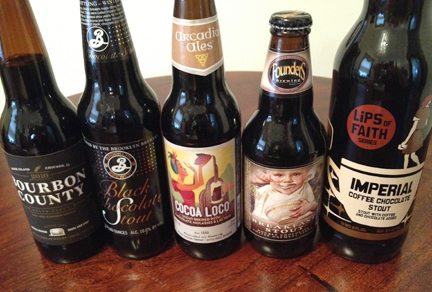 Some of my favorites are Brooklyn Black Chocolate Stout, Arcadia Cocoa Loco, Founders Breakfast Stout, Rogue Chocolate Stout, Southern Tier Jah-va Coffee Stout, Ska Mole Stout. ** Added Tip: The higher alcohol content of the beer, the more difficult it is to get the chocolate filling to the right consistency. I was rather ambitious with my first batch and decided to make Goose Island Bourbon County Stout truffles. It was an absolutely delicious, but a little more difficult to hold it's rounded shaped treat. For my second batch I used Ska Brewing Mole Stout which is around 5% - the consistency was much more desirable. Preheat oven to 350°F. In a large mixing bowl, whisk together dry ingredients. In another medium mixing bowl combine the stout, softened butter. Beat in eggs. Mix in sour cream until thoroughly combined and smooth. Gradually mix the dry ingredients into the wet mixture. Lightly grease 24 muffin tins (or use muffin liners). Divide the batter equally between muffin tins, filling each 3/4 full. Bake for about 10 minutes and then rotate the pans. Bake another 10 to 12 minutes or until toothpick inserted in center comes out clean. Let cool. Frost cupcakes with a small knife or spatula. 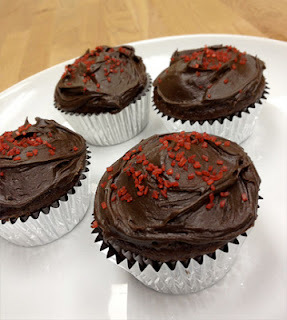 Or for an added tip spoon frosting into a resealable bag, cut a small end off of a bottom corner to use as a piping bag. Frost in a circular motion. Dust with cocoa powder or sprinkles. For a 3-layer cake version, double the ingredients and follow these instructions. Cake Directions: Butter three 8-inch round cake pans with 2-inch-high sides. Line with parchment paper. Butter paper. Bring 2 cups stout and 2 cups butter to simmer in heavy large saucepan over medium heat. Add cocoa powder and whisk until mixture is smooth. Cool slightly. Whisk flour, sugar, baking soda, and 1 1/2 teaspoons salt in large bowl to blend. Using electric mixer, beat eggs and sour cream in another large bowl to blend. Add stout-chocolate mixture to egg mixture and beat just to combine. Add flour mixture and beat briefly on slow speed. Using rubber spatula, fold batter until completely combined. Divide batter equally among prepared pans. Bake cakes until tester inserted into center of cakes comes out clean, about 35 minutes. Transfer cakes to rack; cool 10 minutes. Turn cakes out onto rack and cool completely. Icing Directions: Bring cream to simmer in heavy medium saucepan. Remove from heat. Add chopped chocolate and whisk until melted and smooth. Refrigerate until icing is spreadable, stirring frequently, about 2 hours. Place 1 cake layer on plate. Spread 2/3 cup icing over. Top with second cake layer. Spread 2/3 cup icing over. Top with third cake layer. Spread remaining icing over top and sides of cake. Of course chocolate desserts marry well with a dark, creamy stout or bourbon-aged Imperial Stout, but if you're looking to mix it up a bit lambics and krieks are a fantastic choice. 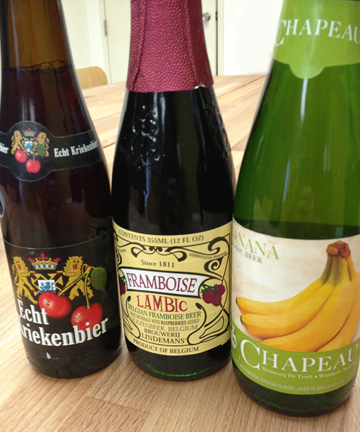 These Belgian style fruit beers are lighter in body and sweeter in flavor, nicely balancing rich desserts and also appeal well to the wine drinkers. Featured here are an Verhaeghe Echt Kriekenbier (Cherry Kriek), Lindemans Framboise (Raspberry) Lambic and a Chapeau Banana Lambic which was surprisingly clean and crisp.